The Domkapitel or – more concisely Kapitel – is something like the board of directors of the Salzburger Dom Cathedral. This committee is very powerful, supported by privileges that developed over centuries – in fact, over more than one and a half millennia. The headquarter of the Kapitel was historically in the Kaiptelgasse, a lane in the Salzburger Altstadt (Old Town) that linked the Kaigasse as a more residential neighbourhood with the Kapitelplatz and the cathedral. Today, the Kapitelgasse is still characterised by Baroque palaces – which is now mostly used by the University of Salzburg. This applies also to the Kapitelhaus, the historic headquarter of the Domkapitel. The Kapitelhaus is where most of the high-ranking officials of the university have their offices alongside with the main administrative bodies. 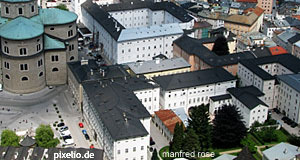 The Kapitelhaus goes back to plans of Prince Archbishop Wolf Dietrich von Raitenau, the father of Salzburg′s Baroque face. For the Domkapitel, he proposed to use the garden of the Dompropstei (sort of the facility manager of the cathedral – for details read our article on the Kapitelplatz) as building land for a new palatial headquarter as early as in 1592. In 1598, a terrible fire destroyed the old Romanesque cathedral and large parts of today′s Altstadt city centre. In response to this, Wolf Dietrich could make plans a lot more drastic than any of his previous building proposals. He liked Baroque designs, large squares and representation. Now, after the fire, there was enough space for trying something new – so convenient for the ambitious, Rome-raised Prince Archbishop that some historians still think that the fire in the cathedral was no accident. In any case, the Kapitelhaus was now to be built. The construction of the new (current) Kapitelhaus started in 1602 and was completed in 1608. If you walk through the Kapitelgasse, you will notice the enormous gate of the Kapitelhaus, decorated with the 24 coats of arms of the Domherren, the members of the Domkapitel – in addition to one coat of arms for both the Propst and the Dechant, who chaired the committee. The 27th coat of arms is the one of Prince Archbishop Wolf Dietrich himself, outlined by the inscription: "MDCIII - Wolfgangus Theodorics Archiep(iscopu)s fecit" ("Made by Archbishop Wolf Dietrich). In the course of the Napoleonic Wars, Salzburg was looted rather badly by French and Bavarian Troops. In 1808, the Kapitelhaus became first an army base and later a warehouse, mostly used for storing tobacco. Until 1990, the Kapitelhaus was then used by the Ministry of Finance, before it was transferred to the University. Other buildings in the Kapitelgasse date back to the same period; there are some humanities departments in the Kapitelgasse as well as administrative facilities.